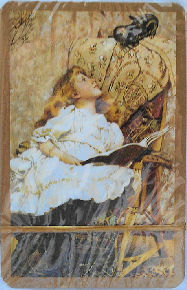 This is a package of playing cards (standard size: 2 3/8" wide x 3 1/2" high) with the image of a girl and a kitten. The playing cards were made in Austria. The package of cards is still shrink wrapped.